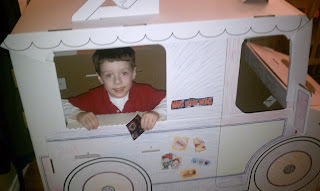 We recently got the chance to review an item from Build a Dream Playhouses. They sell structures made out of cardboard that once you color them and put them together (easy) you get things like a snack shack, castle, spaceship, or a kitchen! I went on the website and showed my son the items they had and at first glance he wanted them all of coarse. There were so many different and cute ideas but he ended up going with the ice cream truck. I thought that he would have picked the castle but he said that he definitely wanted the ice cream truck and I told him to pick. All I heard about was how he was going to make "special deliveries" in his ice cream truck for a few days until the truck came to us in the mail. As soon as it was delivered we just had to open it! All of the pieces of cardboard came without any color on them; it was our job to create our own masterpiece. The cardboard pieces have lines on them like a coloring book so you know where to color and what. 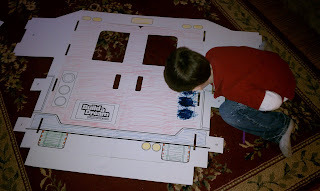 At first the project seemed a little overwhelming with just the two of us to work on it, my husband was still at work and my son was ready to drive off to make his deliveries the second he saw it. I called up my little sister to come over to help; we laid out all of the pieces and got to work. It was fun to see what colors my son chose for what and I have to admit I enjoyed coloring as well. I also thought a good way to cover larger surfaces would be to cut objects out of magazines and gluing them on, that my son thought was cool. He loved that idea and I let him use the glue stick so he was in heaven. That way we it felt like we had personalized it even more. When we were satisfied with our results we started to put it together, by this time my husband was home so he took over the job. It was very easy to do (according to him) everything was labeled by letters so even children could do it. It looked awesome and my son was ecstatic! The back doors open so that you can get in it was huge inside. The little ice cream decorations on top are so cute, but you also have the option to take those off and make it look like a regular delivery truck too. 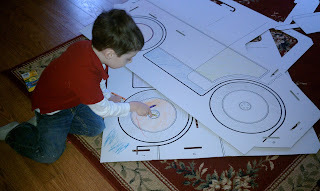 The truck is very sturdy and we were even able to color on it some more while it was "standing up" so we did not need to hurry like I thought we did. The nice thing about the product is that it is sturdy but also light weight. 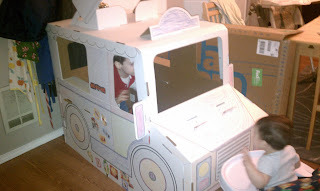 My son can easily pick it up and move it around so he can "drive" around and pretend to take orders for ice cream. We have been making "special deliveries" all week and having so much fun! The nice thing about Buildadreamplayhouses.com products is that they are 100% recyclable after you are finished and your child has torn it all up in time, which I know my son will do someday. It is made of cardboard and will not last forever so when it is ready to be retired you won't have any guilt about your carbon footprint. This was a great project for our family and would be great for a birthday party or special event. It would be fun to have a party and have several different items like the castle, space shuttle and the ice cream truck and let the kids use their imagination to go wild. After they are finished they can bounce around from each creation! For our Moms Leaving the Workforce event Build a Dream Playhouses has generously offered one of our lucky readers the chance to win their very own Ice Cream Truck Playhouse. *Limited to US residents; 18 years old and above. Giveaway starts March 16 , 2011 and ends on March 31, 2011 at midnight PST. Winner will be emailed and has 48 hours to respond before another winner is selected. I was not paid for this giveaway or post.I was provided one Build A Dream Playhouse for free for this review. I follow them on Twitter, partymix25. I also like the Dream Machine. Thanks. I like build a dream playhouses on fb as Arianah Watts. Entry 1 - I really like the Pop-N-Play Castle! Entry 2 - I really like the Pop-N-Play Castle! Oh, how fun! I follow Build a Dream Playhouse on Twitter (@thxmailcarrier). I follow Build A Dream on Twitter! I love the Pop and Play Kitchen! i really like the pop and play castle but they all look like tons of fun. I love the Pop N' Play Castle! The castle tower looks cute! 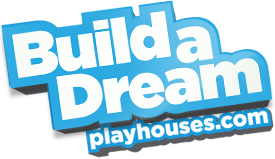 I follow Build a Dream Playhouse on Twitter!